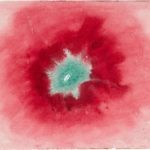 Hilma af Klint’s pioneering abstract art, born of spiritual visions, goes on view at the Guggenheim. 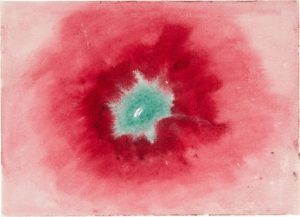 Hilma af Klint, Untitled, 1920, from On the Viewing of Flowers and Trees (Vid betraktande av blommor och träd), watercolor on paper, 17.9 x 25 cm. Hilma af Klint, The Ten Largest, No. 7., Adulthood, Group IV, 1907, tempera on paper mounted on canvas, 315 x 235 cm. Hilma af Klint, Group IX/SUW, The Swan, No. 17 (Grupp IX/SUW, Svanen, nr 17), 1915, from The SUW/UW Series (Serie SUW/UW), oil on canvas, 150.5 x 151 cm. In 1947, an eccentric book appeared under the imprint of Alfred A. Knopf, titled Mona Lisa’s Mustache. The author, T.H. Robsjohn-Gibbings, was fairly well known at the time as a furniture designer who created a sort of Art Deco version of the ancient Greek style. With Mona Lisa’s Mustache, he embarked on a second career as a critic-provocateur. The book, written in a tone that combines humor with hysteria, is a relentless takedown of virtually all modern art from Gauguin to Surrealism and of the curatorial program of the Museum of Modern Art in particular. Equating avant-garde art with magical thinking, Robsjohn-Gibbings portrayed its creators as would-be witch doctors who sought to control the minds of the public through their art. He also facilely equates modern art with fascism, going so far as to blame it for the recently concluded World War. While Robsjohn-Gibbings’ arguments are in many ways absurd and misguided, with his singular focus he managed to put his finger on something that all the other critics had missed—that despite its reputation as secular, scientific, and anti-traditional, modern art owes a tremendous debt to mysticism and the occult. Today this is accepted as fact, because art historians over the past few decades, sifting the evidence without bias, have documented and explicated the extent to which occult beliefs and systems such as Theosophy were essential to the conceptions of pioneers including Wassily Kandinsky, Piet Mondrian, and many of the Surrealists. However, one pioneer, a Swedish woman artist named Hilma af Klint, was left out of the picture, from Mona Lisa’s Mustache until quite recently, for reasons that have more to do with social and market forces that with the nature of her work. 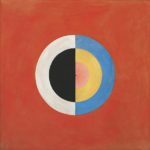 Painting feverishly in 1906 and 1907, inspired by visions she had had during spiritualistic séances and meditation sessions, af Klint created what are probably the first abstract paintings, predating Kandinsky’s by around four years. But she hid her light under a bushel, refusing to show her work and stipulating in her will that the paintings not be seen by the public until 20 years after her death and that they never be sold. While af Klint was a trained artist who started out painting in a late-19th-century Scandinavian realist style, she created her truly original works more as a mystic than as an artist; that is to say, she painted them not to make a splash in the art world but to enlighten humanity—at such time when she deemed it ready to accept the message. Her paintings, she said, belonged not in an art gallery or even a museum but in a temple. Since af Klint was one of the most self-effacing of people, these claims were, for her, not grandiose pretensions but simple statements of fact. Af Klint died in 1944, at the age of 81, leaving behind around 1,200 paintings in her studio. In 1966, her nephew Erik af Klint, a naval officer, and his son Johan “awoke the works from their imposed twenty-year rest and photographed them,” as Johan af Klint puts it, beginning the process of bringing them to public attention. 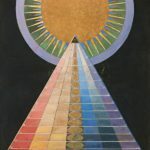 In 1972, having failed to interest an institution in taking on the task, the two men created the Hilma af Klint Foundation, which has shepherded the artist’s oeuvre ever since. In 1986, a few of her paintings were included in a massive show at LACMA, “The Spiritual in Art,” where they excited some discussion, but it was not until 2013 that a major monographic exhibition was mounted, which commenced at the Moderna Museet in Stockholm and toured in northern Europe. 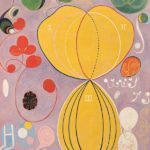 Now, a full view of af Klint’s visionary art is at last coming to the United States, with the Solomon R. Guggenheim Museum’s exhibition “Hilma af Klint: Paintings for the Future,” which opens on October 12 and continues through February 3, 2019. More than 160 works will be on view, mainly from the crucial period of 1906–20 in which the artist made the startling abstract paintings for which she will be remembered. The Guggenheim is a particularly fitting venue for such an exhibition, because it was founded in the 1930s as a repository for exactly the kind of “non-objective” (or geometrically abstract) painting that af Klint espoused. Its original curator, Hilla Rebay, was herself a Theosophist who envisioned the museum as a shrine consecrated to life-transforming art. Unlike af Klint, though, Rebay was an extremely plugged-in networker who was intimately associated with Kandinsky, the Blaue Reiter group, and many other important artists. But she did not know af Klint, and therefore the Swedish artist was not part of the narrative of abstractionist innovation propounded by the Museum of Non-Objective Art, as the Guggenheim was known at the time. So there is poetic justice in a Hilma af Klint retrospective being staged by this particular museum, and as the curators note in the show’s extensive catalogue, the Frank Lloyd Wright design of the building does indeed suggest a ziggurat-like temple similar to the one af Klint imagined when she contemplated the future home of her ahead-of-their time visions. Af Klint’s experiments in abstraction grew out of the activities of a group of women artists who called themselves “The Five.” Beginning in 1896, meeting each Friday, af Klint and her four friends would conduct séances, or what would be called channeling sessions today, in which they believed they entered into communication with otherworldly, wise beings whom they called the High Masters. One of the activities of The Five was automatic drawing and writing (later to be beloved techniques of the Surrealists), and it was through this means that they received the messages. The Masters suggested that a temple eventually be built, and af Klint came to believe that she in particular was being entrusted with the task of creating paintings to decorate it. A series of panels in tempera on paper mounted on canvas that she made in 1907, known as “The Ten Largest,” are over nine feet high, big enough to command attention in any building. These initial efforts broke completely with af Klint’s artistic training, and she felt that the paintings were being done through her rather than by her. Right from the outset, the works eschewed figuration in favor of geometric shapes, lines, and bold colors. Many of them resemble diagrams, as if af Klint were creating schematics of the cosmos beyond Earth or of psychic processes behind the eyes. 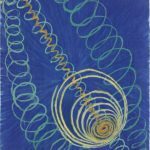 In her paintings, unlike in some forms of abstraction, three-dimensionality is not absent; spheres intersect with planes, lines, and circles, and space seems to hum with a glowing, vibrating energy. They convey a sense of being in the realm of Platonic forms, in which pure thought is made visible. The only elements of figuration are occasional allusions to architecture, as when a series of rectangles of diminishing size suggest a rainbow-colored pyramid or staircase, surmounted by a refulgent sun, in Group X, No. 1, Altarpiece (1915), or to celestial objects such as the Saturn-like spheres in the series “Group IX/UW, The Dove” (1915). Another departure from pure “non-objective” painting in af Klint’s work is in the inclusion of letters and astrological and other occult symbols, giving the paintings the feel of diagrams from alchemical books of the Renaissance—an era in which science and magic frequently overlapped. On the whole, as the curators observe, af Klint’s work can seem just as scientific as mystical, and her meticulous style has something in common with the kind of technical drawing that was being developed by Swedish naturalists at the time to record their observations. In 1908, af Klint met the Austrian occultist Rudolf Steiner, the founder of Anthroposophy, who advised her to rely less on High Masters and find the source of inspiration within herself, her higher Self. From this point on her work became less “automatic” and more intricately conceived. Steiner, himself an explorer of the regions in which science and mysticism meet, had a great influence on af Klint in the years that followed, and in her wandering life she spent a good deal of time at Steiner’s center in Germany, called the Goetheanum. But she had no contact at any point with her fellow explorers in the realms of abstract art, and so her work, brilliant and beautiful though it is, was destined to grow in isolation and remain unknown until the promised future, which now, in the early 21st century, appears to have arrived.